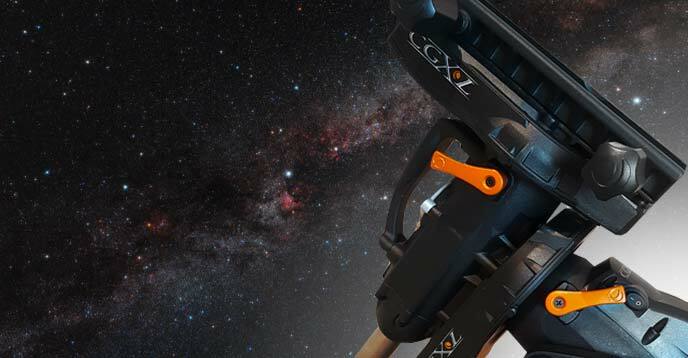 The Celestron CGX-L is a robust, professional grade computerized equatorial mount with an impressive 75-lb payload capacity. The deep sky astrophotography potential of the Celestron CGX-L is obvious, and I intend to experience this benefit first-hand. The CGX-L is the largest equatorial telescope mount I have ever used for astrophotography, with payload capacity that surpasses the incredible iOptron CEM60 (by 15 pounds). The added stability will come in handy when using the largest telescopes in my inventory, such as the William Optics FLT 132 refractor. Later this year, I will run a complete Celestron rig that includes the exciting new Celestron 8” RASA F/2. This incredibly powerful GoTo telescope mount was generously loaned to me from High Point Scientific for review. The Celestron CGX-L with an 8″ RASA mounted on top. 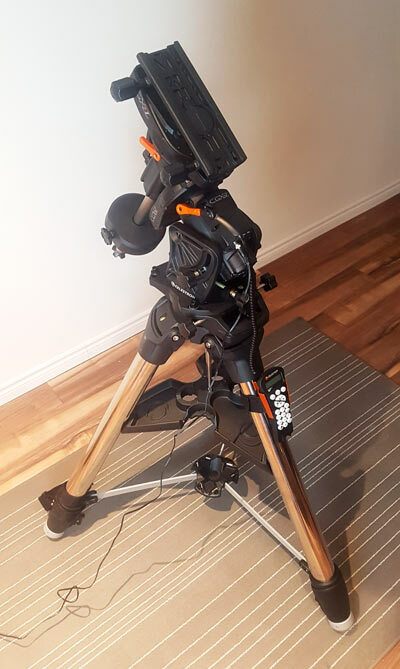 If you are new to astrophotography and computerized telescope mounts, a GoTo equatorial mount like the CGX-L allows you to choose an object from the hand controller database, and the mount will slew to your desired target. This includes Solar system objects such as planets and the moon, named stars, and deep sky objects. The NexStar hand control screen on this mount will also display useful information about the selected object such as magnitude, constellation and extended information about the most popular objects. Needless to say, whether you’re using a telescope for visual use or for astrophotography, a GoTo telescope mount will spoil you. In this post, I’ll go over the specifications and features of Celestron’s latest flagship telescope mount. I’ll also take you along for the ride as I prepare this mount for some backyard deep sky astrophotography from the city. 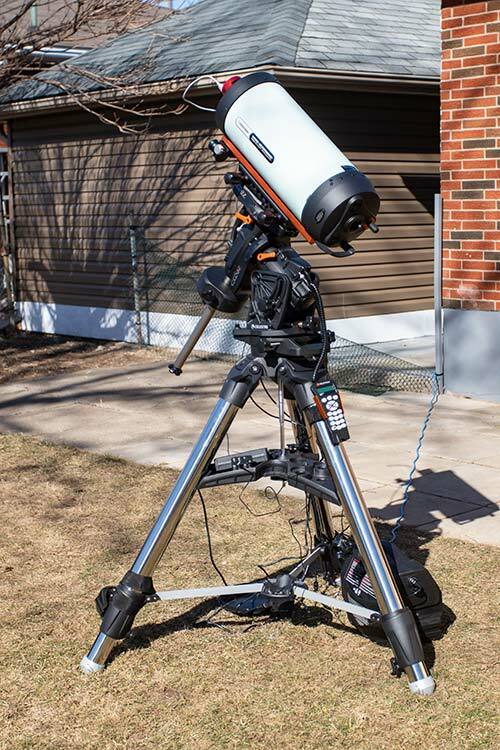 The Celestron CGX-L computerized mount is capable of carrying Celestron’s largest optical tubes, and was designed for serious imagers and their backyard observatories. Despite the fact that this is the most massive telescope mount I’ve ever experienced, it actually has an exceptional load capacity to weight ratio. Celestron designed the CGX-L to be as compact and portable as possible. Coming from someone who doesn’t own a backyard observatory, I can appreciate this feature! I’d love to fasten the CGX-L mount to a fixed concrete pier under a roll-off roof, but for now I’ll be carrying this mount in and outside of the garage, tripod and all. In the past, I have enjoyed using equatorial telescope mounts from iOptron, Sky-Watcher, and yes, Celestron. My very first telescope mount for astrophotography was a Celestron Advanced Series CG-5, and it is responsible for many of the images in my photo gallery. The positive experiences I had with this entry-level Celestron telescope mount early on are why I fully expect to fall head over heels for the CGX-L. The EQ mount head of the Celestron CGX-L is manageable considering its payload capacity. I can’t imagine traveling with the Celestron CGX-L mount, but that will depend on how manageable the setup process experience is in my backyard. For now, the idea is to build a semi-permanent deep sky imaging rig that utilizes all of the Celestron CGX-L’s inspired features from my backyard. Let’s have a look at the key design goals of the Celestron CGX-L. 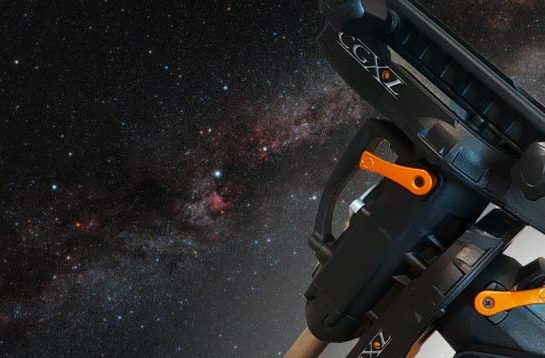 The Celestron CGX-L hit the market in early 2017, and it brought several new, modern features to the world of observatory-class equatorial mounts. One of Celestron’s key design goals for the CGX-L were to increase the diameter of the worm wheels to 144mm, which provides smoother movement and can drive heavier telescopes more efficiently. The dovetail saddle on the CGX-L is an impressive 270mm in length, which owners of larger optical tubes will appreciate. It’s reassuring to know that your expensive telescope and astrophotography accessories are safely secured to the mount head and with added security and stability of a larger saddle. 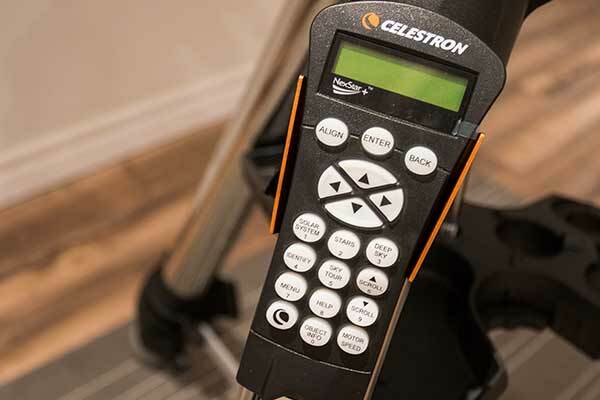 Because this mount is an attractive option for those looking to build a permanent, remote observatory, Celestron has included a number of remote operation-friendly features. This includes everything from built-in home and limit optical sensors to well-thought-out and convenient cable management options. Attention was given to the ergonomic details of this mount, to make it as compact and manageable as possible for its size. Having moved this telescope mount from one house to another, I can honestly say that it was no more difficult to disassemble and transport than my much smaller Sky-Watcher EQ6-R Pro. The mount feels incredibly sturdy and heavy, and yet takes up a modest footprint despite its massive payload capacity. 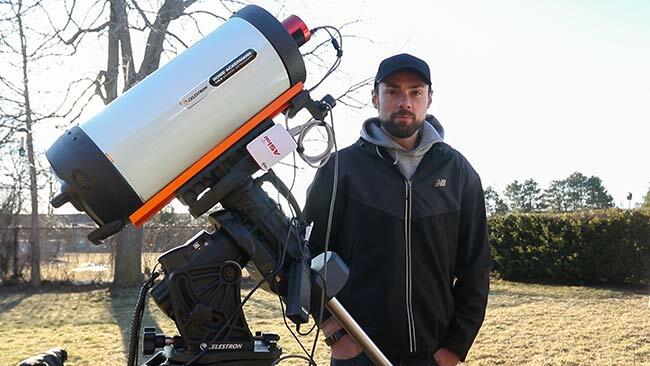 The execution of a telescope mount that is both compact and easy to manage yet is observatory-grade is a testament to the evolution of our hobby. Decades of engineering and user-feedback have been applied to the CGX-L, and you can feel it when you use this mount. The total kit weight including the tripod is 120 lbs (not including the telescope attached). The head on the Celestron CGX-L has a relatively low profile. 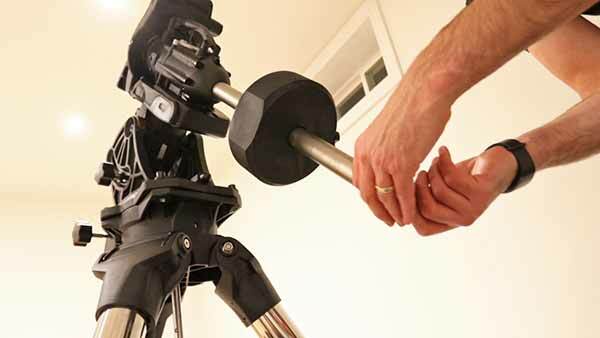 This makes it feel compact and stable, which you can feel when you place the mount on the tripod base. The mount uses Celestron’s latest motors, that have been described from the manufacturer as having more torque, and improved slewing and tracking accuracy under heavy loads. The heavy-duty belt-drive system in the CGX-L can be observed and monitored first-hand thanks to the ingenious clear windows covering these parts. This allows you to watch the underlying motor operation of the mount as it operates with your telescope gear on top. These critical equatorial mount actions are normally hidden underneath a hard cover, and Celestron’s transparency of this operation says a lot about their confidence in the design. When it comes to the critically smooth operation needed for long exposure astrophotography, friction must be avoided at all costs. The guts of the CGX-L include a spring-loaded brass worm wheel and a stainless steel worm gear to optimize gear-mesh and deliver reliably smooth movements. 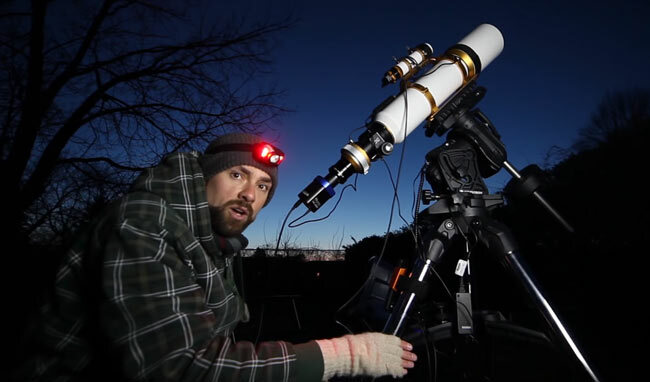 See the Celestron CGX-L telescope mount being used with the 8″ RASA in this video. To me, there is nothing scarier than a cable snag that damages my photography equipment or the mount. I also have a somewhat unjustified fear of my camera or telescope striking a tripod leg during operation. It has never happened to me yet (knock on wood), but I have had a number of close calls over the years. For this reason, I prefer to stay close by to my equipment when slewing to a new object. I can proactively help move any potentially hazardous cabling out of the way as the telescope changes position. But what about those that are running a telescope remotely, and can’t be there in person to avoid disaster? Mounts like the Celestron CGX-L are prepared for this scenario thanks to an internal cabling design. Both the power input jack and lower accessory ports remain in a stationary position while the mount slews to a new target. The mount also includes internal hard stops in both axes to prevent cable tension or a costly tripod strike. This type of worry-free operation is absolutely critical for those that are using this telescope mount in a remote observatory. For non-permanent backyard imagers like myself, I can leverage these features to take my astrophotography imaging automation one step further. That means fewer trips outside to monitor the equipment, as I can comfortably slew to a new object or perform a meridian flip from inside the house. The Celestron CGX-L includes clever “home sensors” that tell the mount exactly where the primary index position is. This feature allows you to start the mount in the home position even if it was in another orientation before a power reset. This is something I’ve never experienced before on any of my telescope mounts, and I can certainly see the benefits of this attribute when using the CGX-L in an observatory. The built-in limit sensors will automatically stop the mount from slewing or tracking before reaching the hard stop fail-safe. The operational “safety” features of the CGX-L are imperative for observatory installations, yet could be a lifesaver to anyone using the mount in a portable backyard configuration like myself as well. The Celestron CGX-L being used with a William Optics Fluorostar 132 refractor. The EQ head position of the CGX-L is adjustable, which may help you optimize the center of gravity over the tripod once your astrophotography gear is mounted. This will also offer more flexibility in terms of latitude adjustments, as this mount is capable of setting latitudes of 3°- 65°. The dual dovetail saddle provides convenient mounting options for both Vixen and Losmandy dovetail bar configurations. 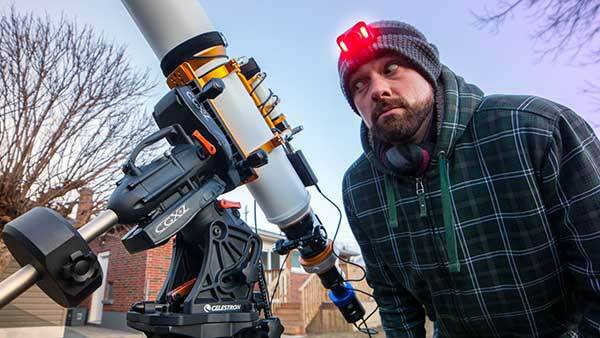 My Sky-Watcher Esprit 100 ED and William Optics Fluorostar 132 telescopes both feature the wider 3-inch “Losmandy” style dovetail for improved stability, and fit securely on the CGX-L. The tripod itself is exceptionally solid and stable. The 70mm legs are the biggest I have ever seen, yet do not take up an absurd amount of space when collapsed. Celestron has noted that the legs now sit wider than ever before, which adds stability. When I realized this subtle change, I instantly thought about how JMI will need to produce a new, wider Wheelie bar to accommodate the CGX-L. Speaking of subtle changes, the minimum height of the tripod has been lowered based on user feedback (not from me… I’m 6’3”!). The integrated handle is very much appreciated when lugging the massive EQ head of the mount around when not attached to the tripod. It is extremely heavy, yes, but surprisingly manageable considering the incredible 75-lb payload capacity it can carry. The Celestron CGX-L includes their new PWI telescope control software that was co-developed by PlaneWave Instruments. Thanks to a feature known as “multi-point mount modeling”, this mount boasts extremely precise pointing accuracy. This should be interesting to test in the backyard with only an accurate polar alignment procedure beforehand (no plate-solving). I am no stranger to a 3-star alignment routine, and I look forward to seeing just how close the CGX-L comes to hitting that first alignment star. Speaking of Polar Alignment, the Celestron CGX-L includes the well renowned All-Star Polar Alignment software in the hand controller. I haven’t used this feature since my early days of deep sky astrophotography with my humble CG-5. This software assisted polar alignment routine is an attractive option for those that don’t want to use external tools or resources to align the polar axis of the mount. You can polar align the mount using any bright (named) star in the sky without using additional polar alignment accessories or apps. The Celestron NexStar Hand Controller. Celestron’s famous NexStar hand controller is included with the CGX-L, and includes and a practical USB 2.0 port. This is where I will connect the mount directly to my imaging laptop computer using the PWI software. There are 2 autoguiding ports for flexible cable management configurations, so I officially have no excuse for a tangled mess of wires with this mount. The 12V DC power input barrel connector is threaded, a feature I am seeing more and more with newer mounts. If you have ever jostled the power input on your mount and lost connection while imaging (like I have several times), you’ll definitely appreciate this subtle upgrade. The internal real-time clock saves the time and observation site information you have entered even after the mount has been powered off. I look forward to testing the mount control and plate-solving abilities of the ZWO ASIair with the CGX-L. Because this NexStar mount supports the INDI protocol, I can tap into some of the handy functions on the ASIair app from my tablet. 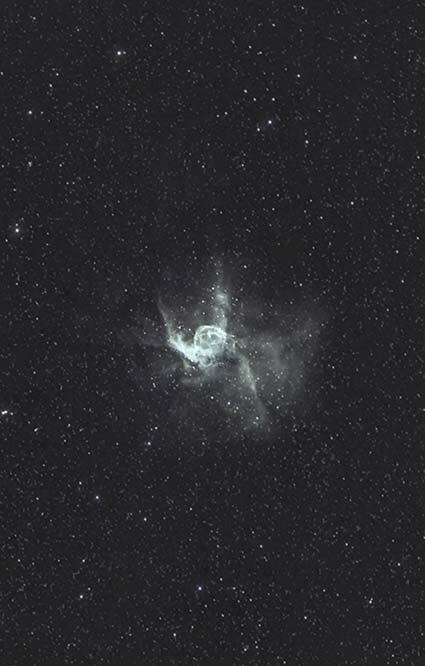 NGC 2539 (Thor’s Helmet) photographed using the RASA 8 F/2 on the Celestron CGX-L mount. The Celestron StarSense AutoAlign feature is handy for those that are tired of lengthy 3-star alignment routines to train the telescope mount. This is something I have become accustomed to over the years with my previous computerized equatorial mounts. This accessory uses self-alignment technology to and a small digital camera to automatically capture a series of images in the night sky and identify them. It matches the images with an internal database to determine exactly where the telescope is pointed. This tool includes advanced mount modeling for better pointing accuracy from horizon to horizon. The CGX-L is one of many compatible Celestron mounts that can utilize the StarSense AutoAlign telescope accessory. The instruction manual is very helpful with detailed information, photos, and diagrams. One such nugget of valuable information is Celestron’s advice about orienting the mount so that the counterweight shaft is directly over a tripod leg. Naturally, this orientation provides better stability, but also creates more room directly behind the telescope. 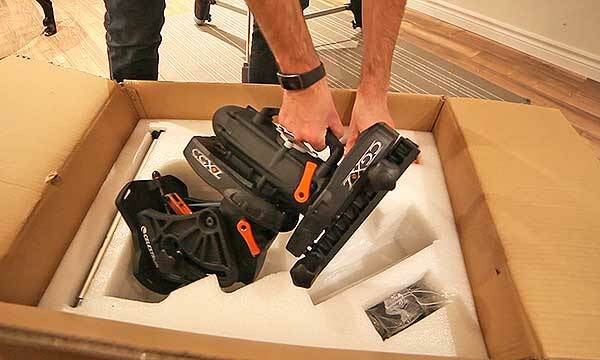 The CGX-L contains a not-so-secret 8mm Allen wrench underneath the bottom carry handle. It’s little touches like this that let you know that the team at Celestron spent a lot of time thinking about the overall user experience. The counterweight bar has a high-end brushed-nickle looking finish. It is also very long and heavy, with serious looking threaded stop nut at the end (toe-saver). The DEC and RA clutch levers are extremely solid and secure. They are finished in Celestron orange, contain the iconic “C”, and even reveal a subtle sparkle sheen when viewed under the right lighting. They are substantial in your hand and feel secure when you lock them into place. There is no questioning whether the clutch has engaged or not. Attaching the 22-lb counter weight to the mount. 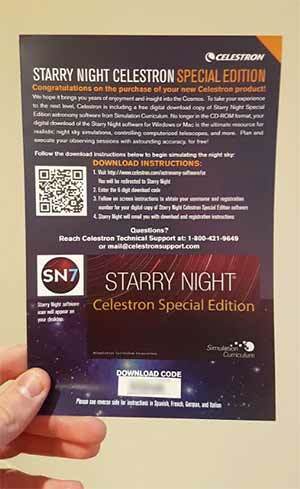 When you purchase the Celestron CGX-L telescope mount, you receive a free copy of Starry Night Celestron Special Edition 7. Inside the protective sleeve that includes the manual, you’ll find a promotional card that displays your unique download code. All you need to do is visit the Celestron website and register the product to gain access to the download. The software is available for both Windows and Mac operating systems. I downloaded the Starry Night Celestron SE 7 software for my imaging laptop running Windows 10. 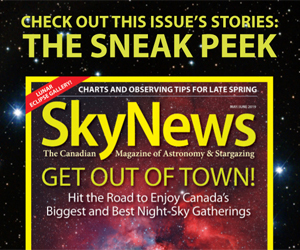 This edition of Starry Night can be used to run realistic night sky simulations, and more importantly, control computerized telescope mounts such as the CGX-L when connected to the Aux. port. I hope you have enjoyed this overview and first look at the Celestron CGX-L computerized GoTo mount. I’ve had this amazing piece of equipment in storage for two months now, and anxiously await an opportunity to put it to work under clear skies this month. You can expect a full review of this observatory grade telescope mount in the coming months. I will discuss the astrophotography performance of the mount from a practical point of view. This includes autoguiding performance, tracking accuracy, the NexStar control system and general use in the field. 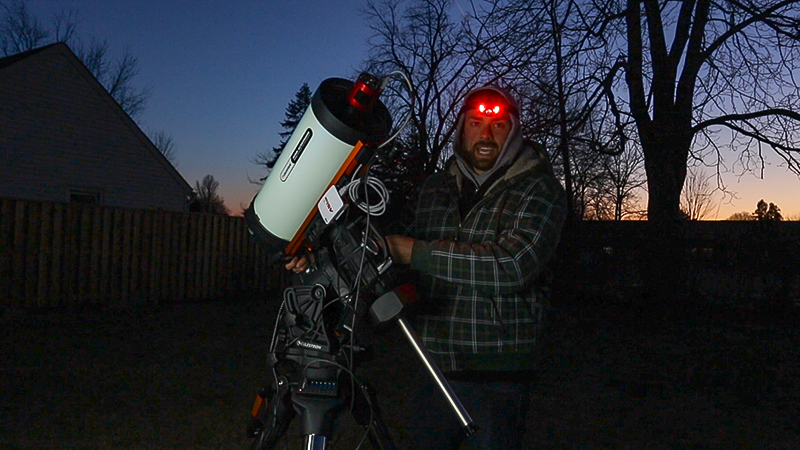 In March 2019, I took the Celestron CGX-L for a test drive on the Leo Triplet (Click for video).